Born: August 11, 1892 in Taunton Ma. Died: January 24, 1958 in Bourne Ma. at 65 yrs, 5 mos, 13 d.
Where Lived: 80 Depot Rd. in Cataumet Ma. 1. William Alfred Howard; ( April 23, 1917 – May 26, 2006); Married Dorothy Lindell (1919 – 1981) (Harry A. Lindell & Agnes A. 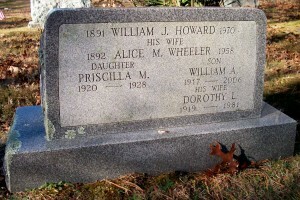 (–)) in Providence R.I. on November 29, 1941; William & Dorothy are buried in Pocasset Cemetery. 2. Priscilla Mary Howard; (1920 – February 19, 1928); Priscilla died at 7 yrs, 7 mos, 2 d. & is buried in Pocasset Cemetery.